As I’m texting my friend, my husband calls. I pause. I think, “He may need something.” I take a breath and pick up the phone. As I do, my children come into the kitchen. I hear the dog scratching on the back door and I go to let him in. I look up at the clock. “Love,” I tell my husband, “I’ll have to call you after I drop off the kiddos at school.” I answer my children’s questions, we get some more breakfast, everyone gets their shoes on, and we head out the door. Then I look over at the kitchen table: the green Emergency Contact form is still there. Blank. Has this ever happened to you: You sit down to do something that needs your attention and requires a bit of concentration when someone calls, a text comes in, someone comes into your office (or kitchen! ), an important email pops up that you have been waiting for…and an hour later, you discover that you still haven’t done that original task? In the age of “smart phones” and handy gadgets that are supposed to help us to feel more organized and connected, many of us can feel more distracted, unorganized, and disconnected. “Focus” has become the new challenge and the new skill to hone – at the office and at home. There are thousands of books, apps, and articles filled with tips to “get organized.” But dealing with distractions is more than just about applying the right time management practices. How effective do you think “time management practices” are with a busy monkey mind, a restless body that’s designed to move but sits all day, and a world full of distractions? Now what about this: time management practices + mindfulness? Now we have more clarity, calm and focus. Mindfulness and meditation – when practiced every day and even in small increments – prime our minds to be able to focus, to respond instead of react, and to make wiser decisions. When we regularly practice mindfulness and meditation, we are connected to what is most important and we can go about our day honoring what really matters. The Mind-Body Connections series for 2014-2015 presents: A Year of Leading a Soulful Life. In a culture of hurry, worry, and busy, we can get so distracted by what has to be done immediately that we put off tending to what really matters. This year, we are about reclaiming that soulful life we want to live. And it begins with getting focused. On Wednesday, September 10, at 1 p.m., we’ll have our first Mind Body Connections workshop of this academic year: Ready, Set…Pause! Priming the Mind to Focus. We’ll be talking about (and practicing!) how to prime your mind to focus so you go about your day (and your life) in a such a way that honors what is really most important. We’ll explore a few of the most effective time management practices that have transformed my life (and our house!) AND mindfulness and meditation practices that are the foundation for clarity, calm, and focus. And as always, you’ll walk away with practices you can start using the minute you head back to your office and home. Please join us. You can register here. You can find out more about the monthly Mind-Body Connections workshops and the themes for winter and spring here. Oh and by the way — the Emergency Contact form did get filled out…eventually. I’ll share more about the big time management mistake I made that morning but how mindfulness and meditation helped me to choose “what’s most important” and to let go of what didn’t matter in the moment. 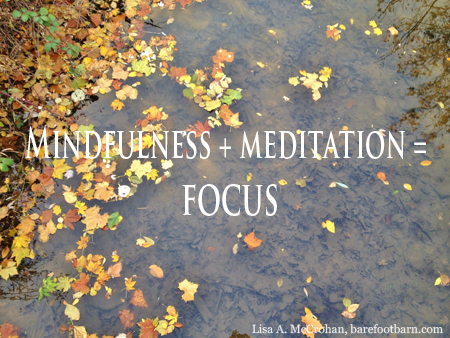 This post was written by Lisa A. McCrohan, MA, LICSW, RYT, Wellness Workshop Facilitator and founder of Barefoot Barn..